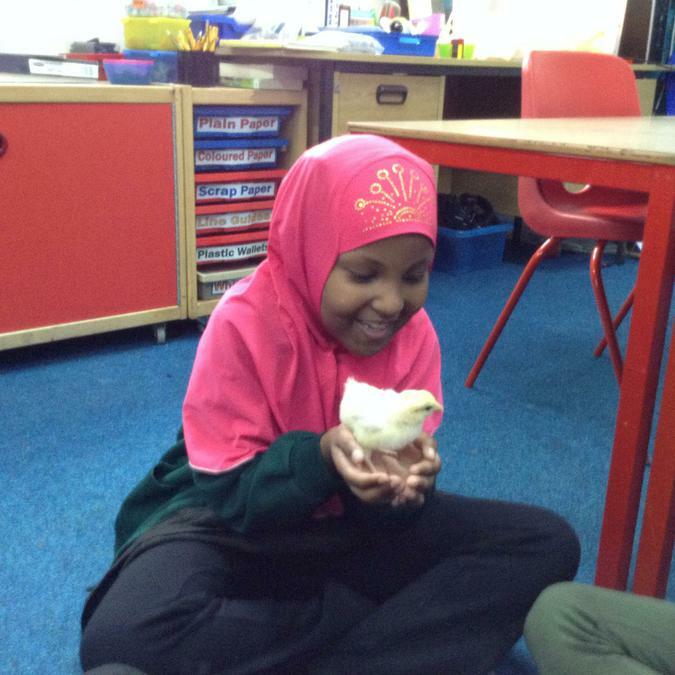 Living Eggs is a special programme where children can learn about the life cycle of a chicken. 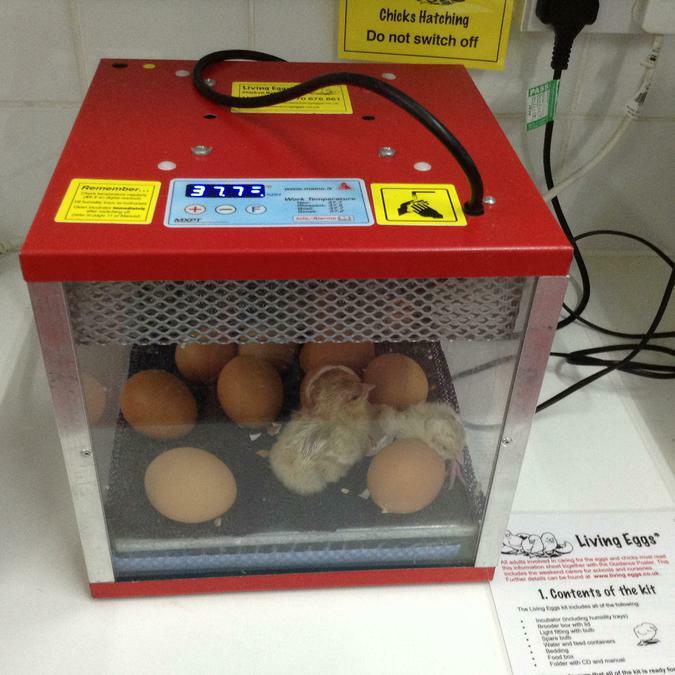 The programme involves eggs being delivered to school; these are then put in an incubator where the children can observe them. 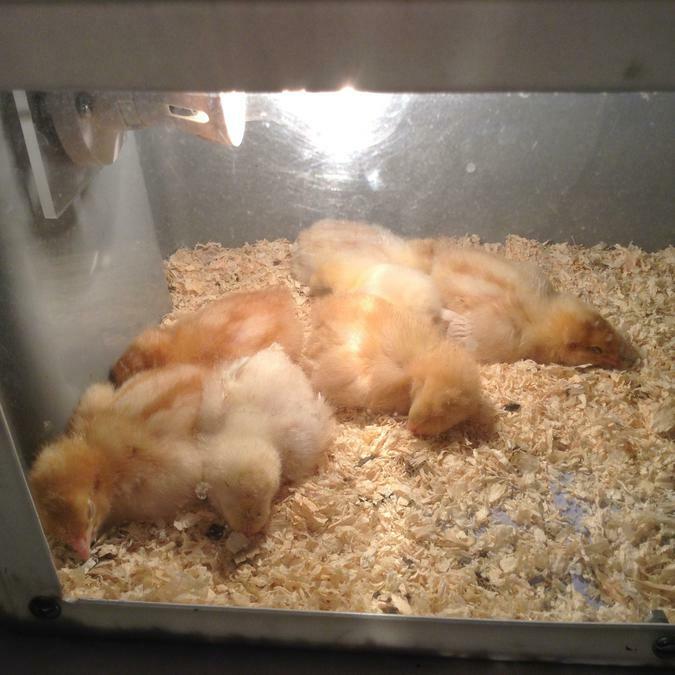 When the chicks hatch they must remain in the incubator until their feathers are all dry and fluffy. 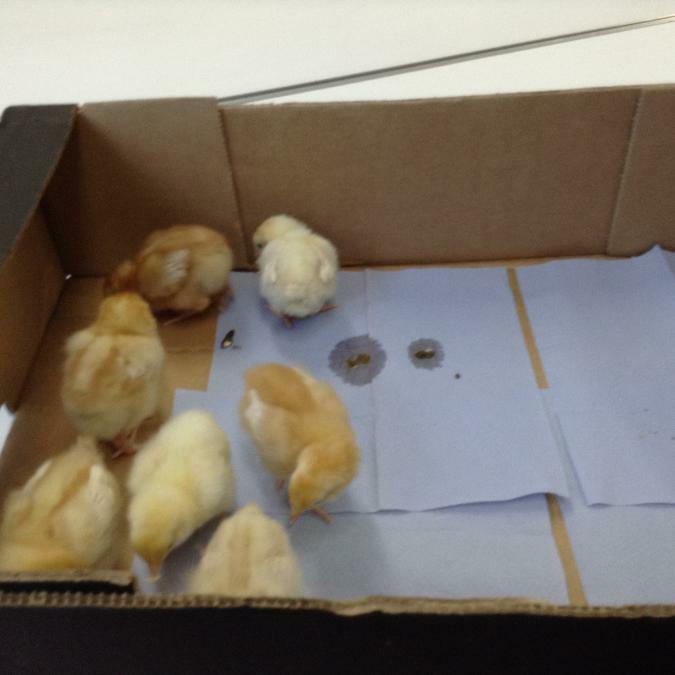 They are then moved to a special box called a brooder. 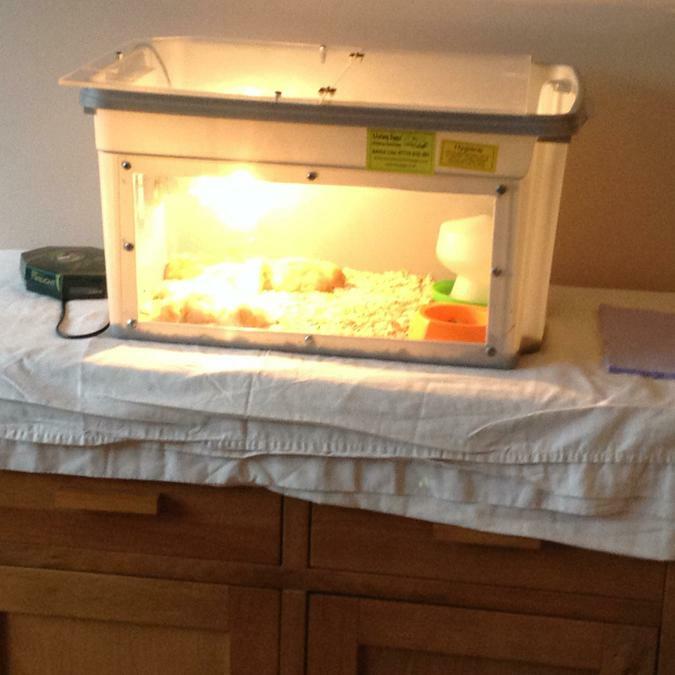 There is a light in here which keeps them warm, they have food and water and lots of space to move around. 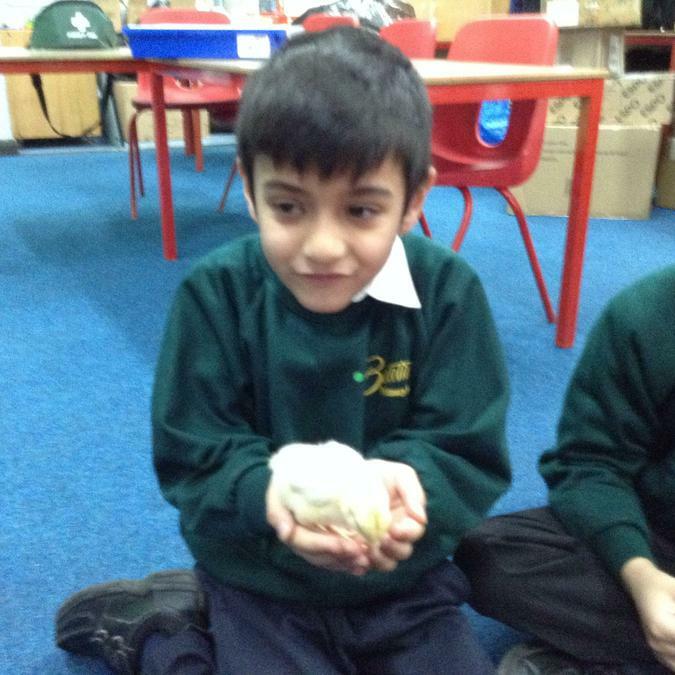 The children are able to observe the chicks, see how much they grow and even hold them. 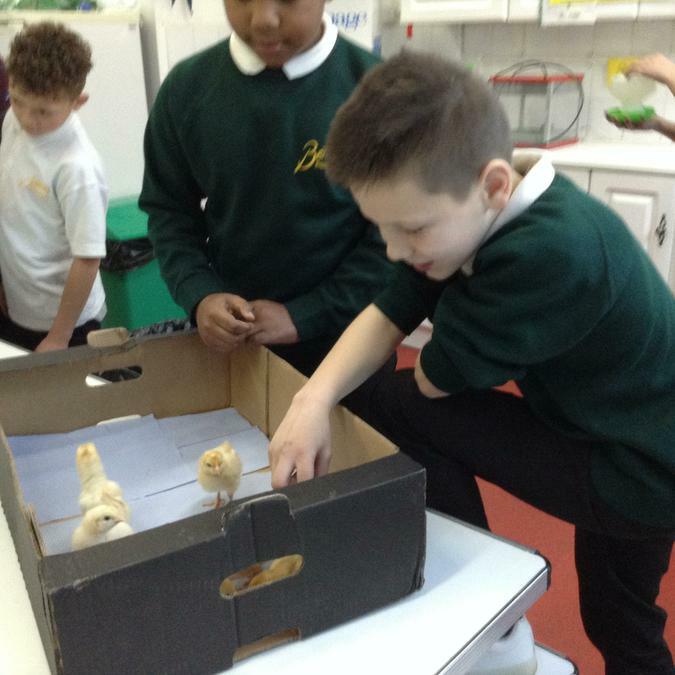 This experience provides lots of opportunities to learn many things about chickens - their life cycle, what they eat and drink, what they look like, where they live and much more. 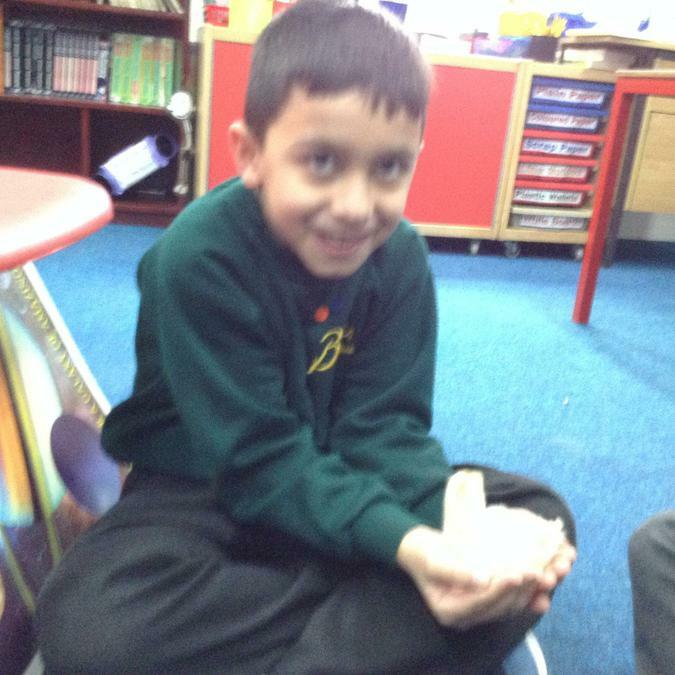 Keep checking our website to watch their progress! 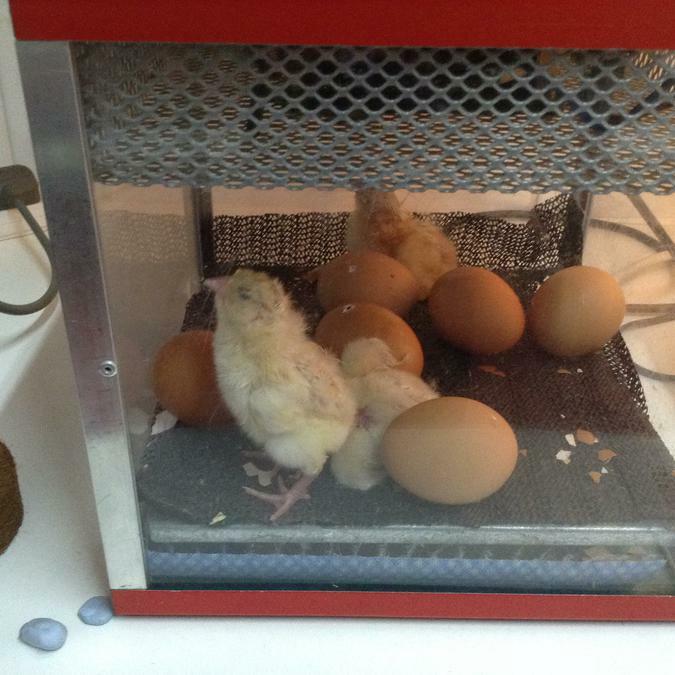 11 eggs have arrived in school this morning. 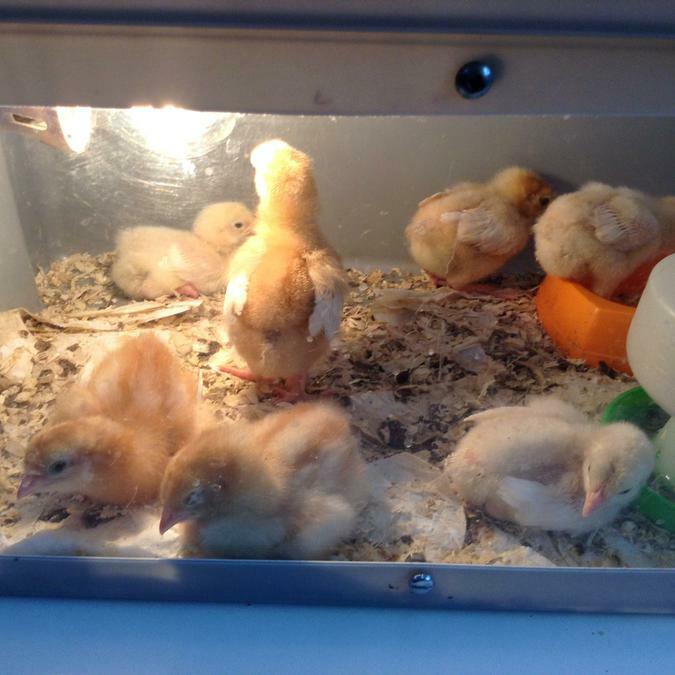 They have all been put in the incubator where they will be nice and warm. 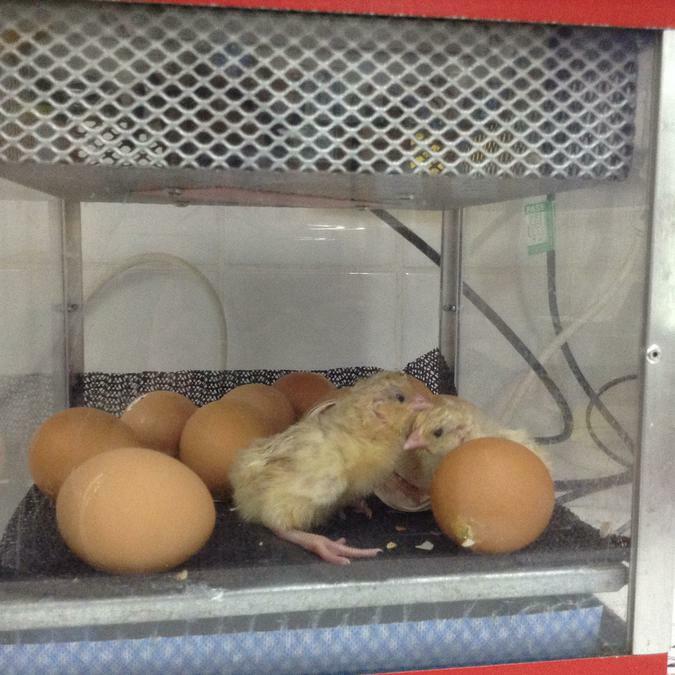 I wonder how long it will take before they hatch. 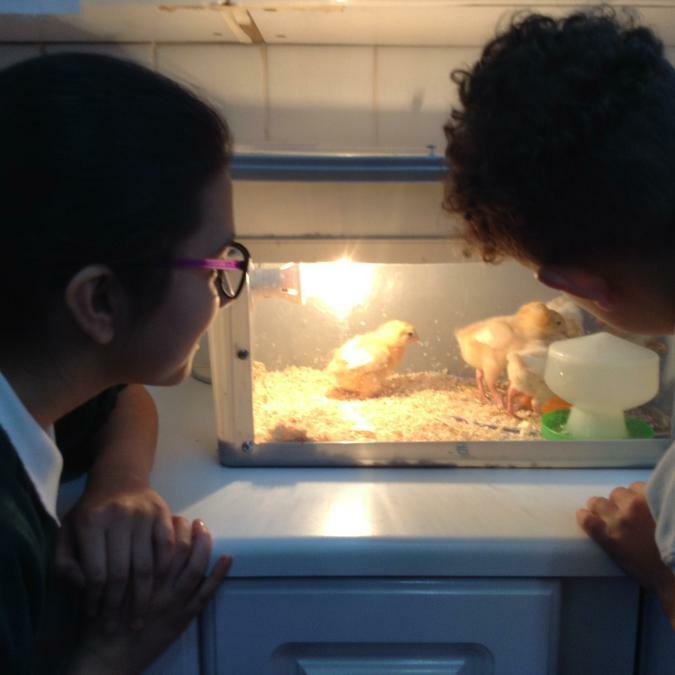 When Mrs Holt got to school this morning 2 chicks had already hatched out of their eggs. 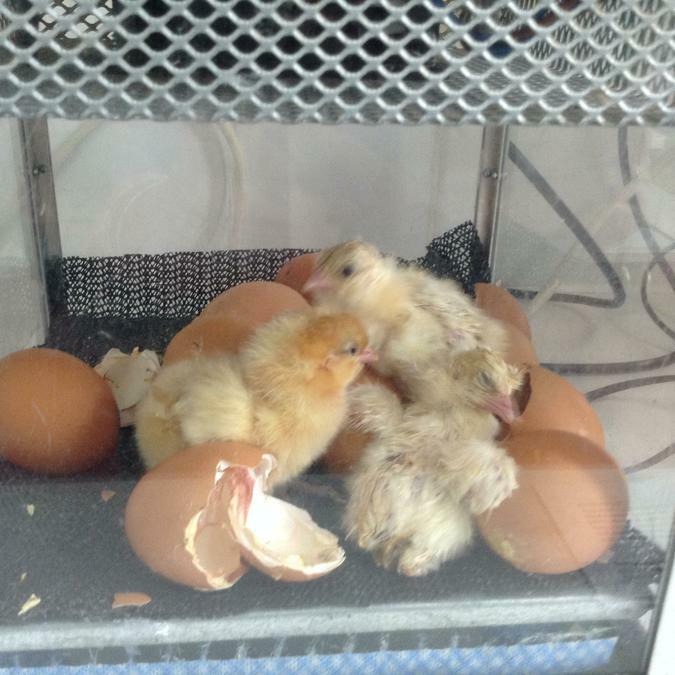 By the end of the school day 3 more chicks had hatched. WOW! 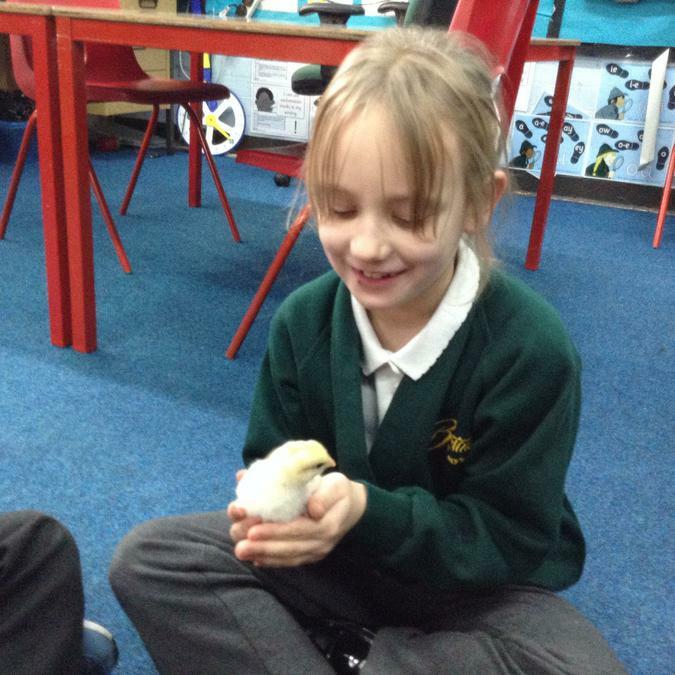 We have got 5 lovely chicks. 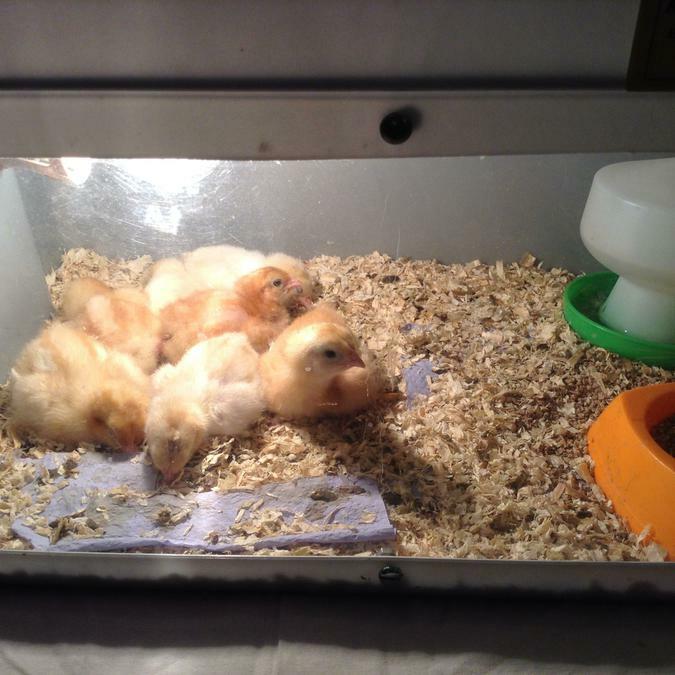 We moved 2 dry and fluffy chicks into the brooder. 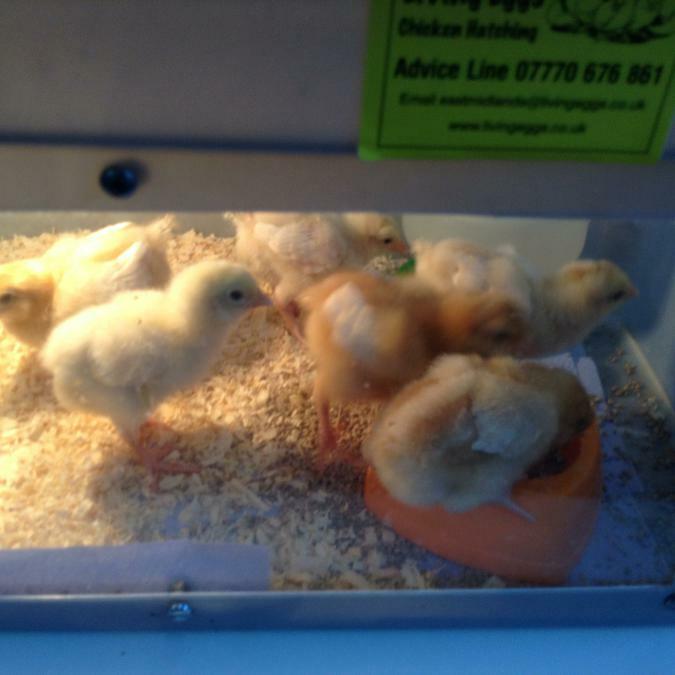 We left the other 3 chicks in the incubator to allow their feathers to get nice and dry. 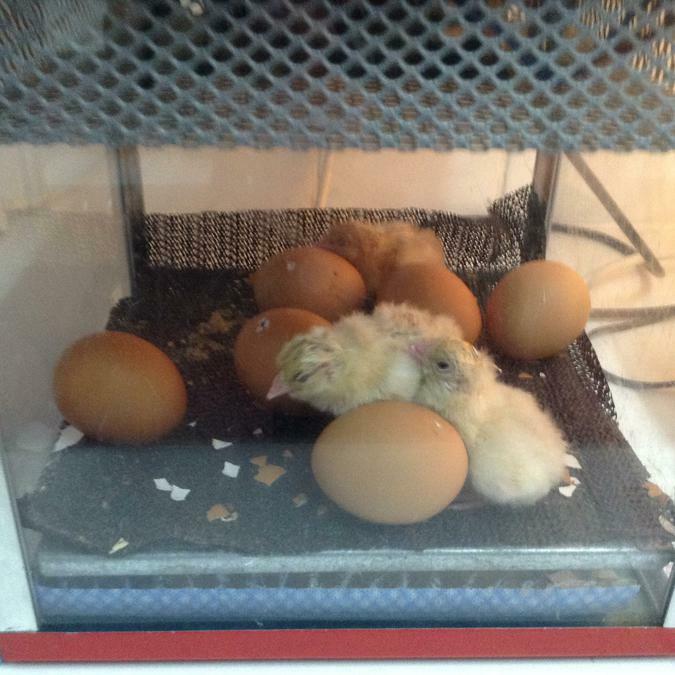 They are making lots of chirping noises. We can hear them all around school! 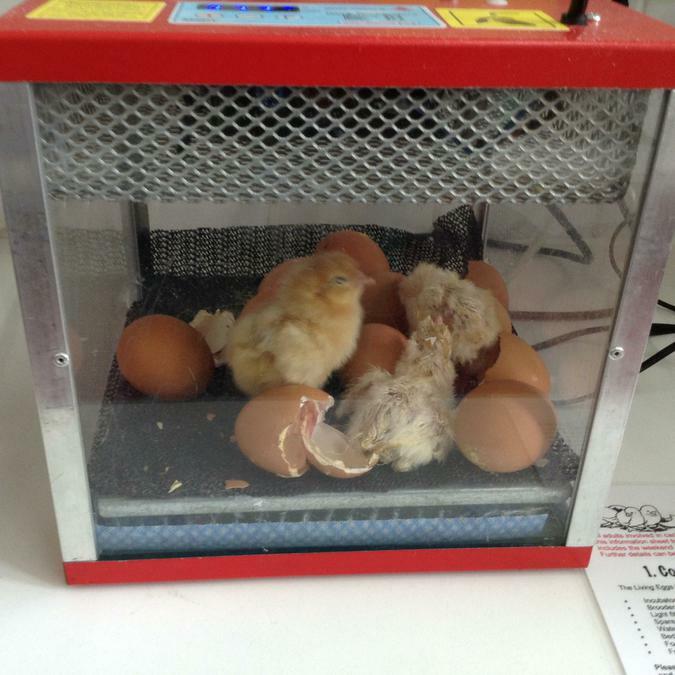 When we got to school today 2 more chicks had hatched out of their eggs. 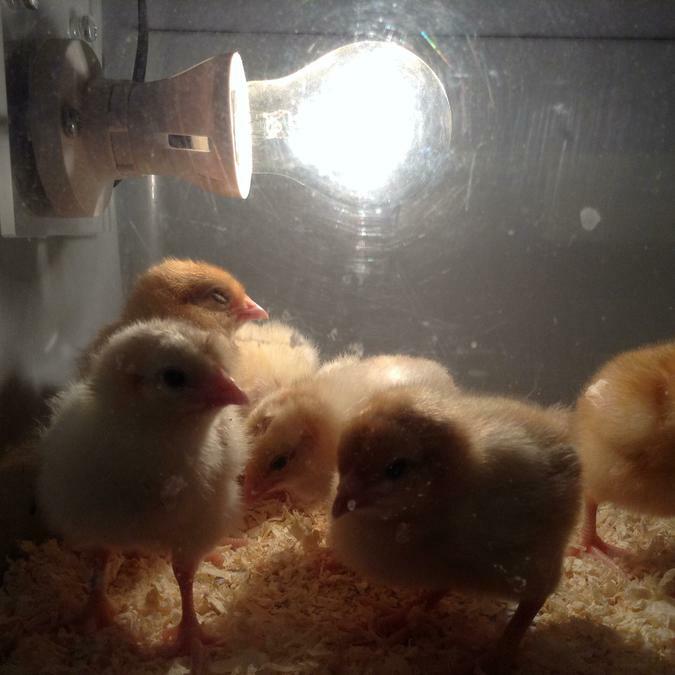 The 3 chicks still inside the incubator now had lovely dry and fluffy feathers so we moved them into the brooder to be with the other chicks. 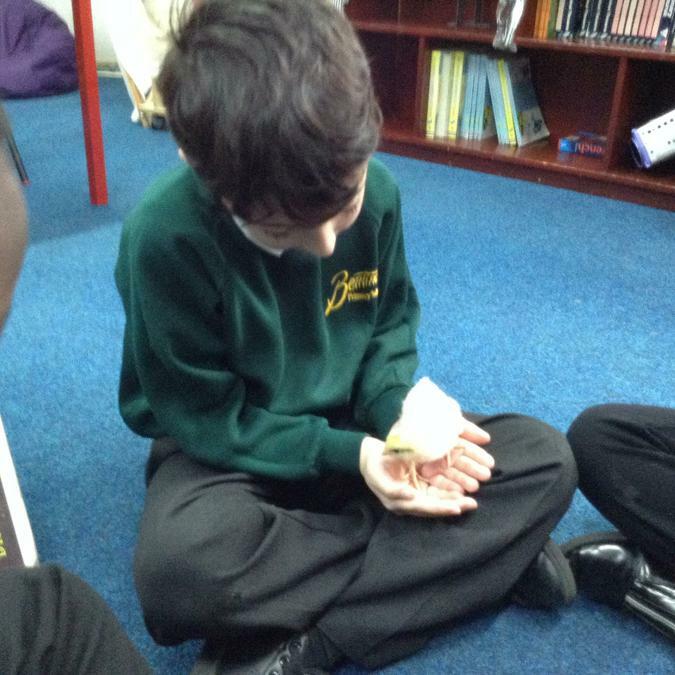 There was another egg that was beginning to hatch! 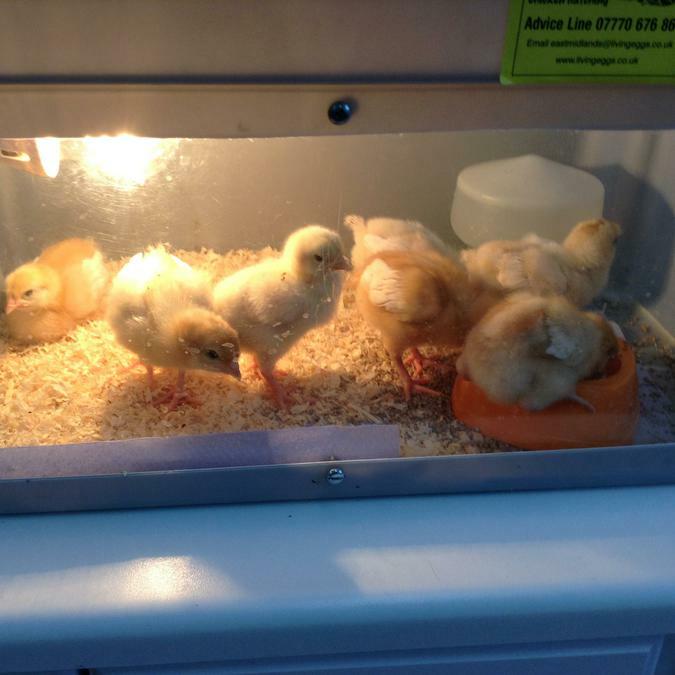 We have 7 very healthy chicks which is amazing! 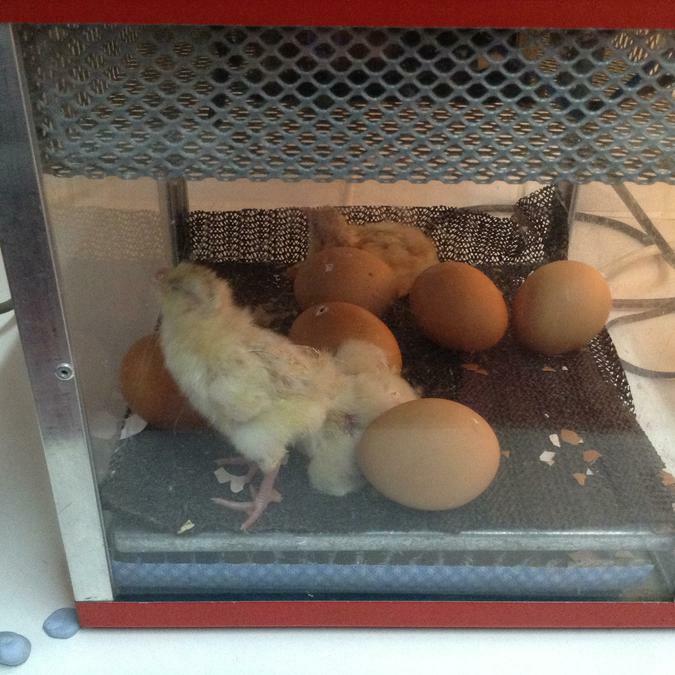 4 eggs didn't hatch, sadly, this happens sometimes. 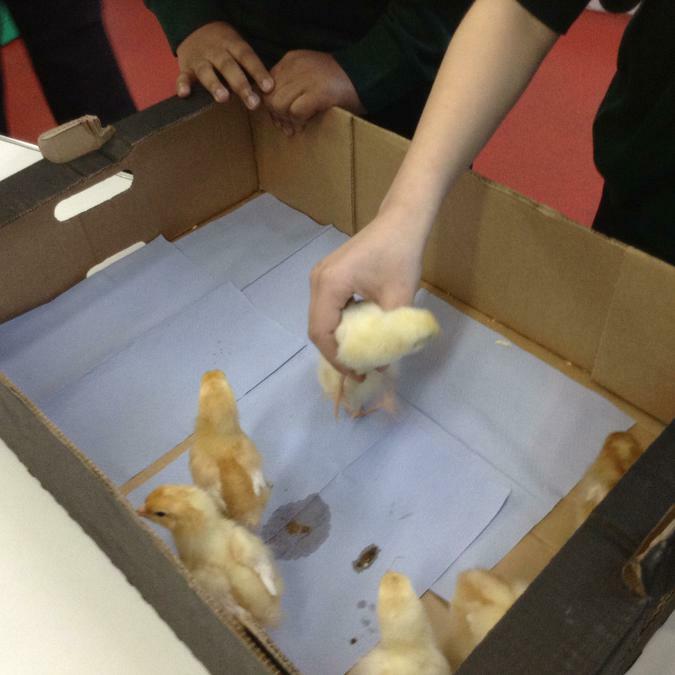 We now need to look after these chicks. 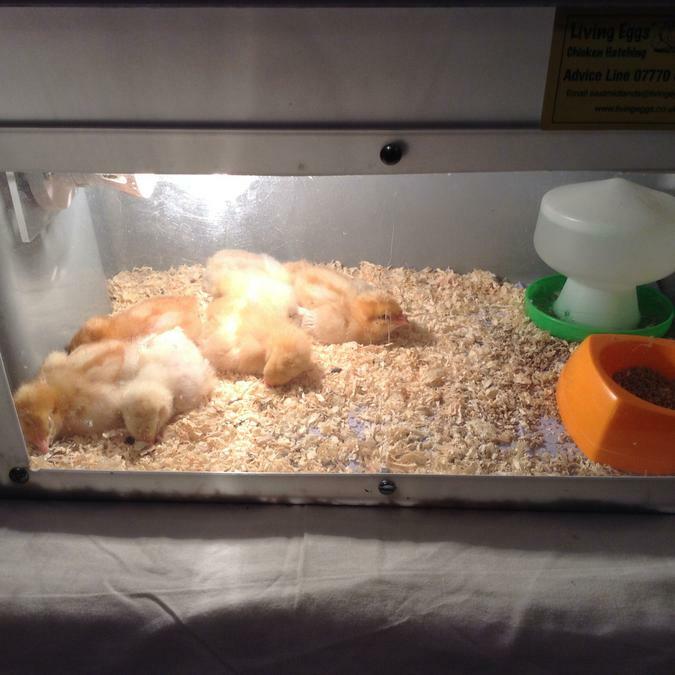 We must clean out the brooder everyday, top up their food and give them fresh water. 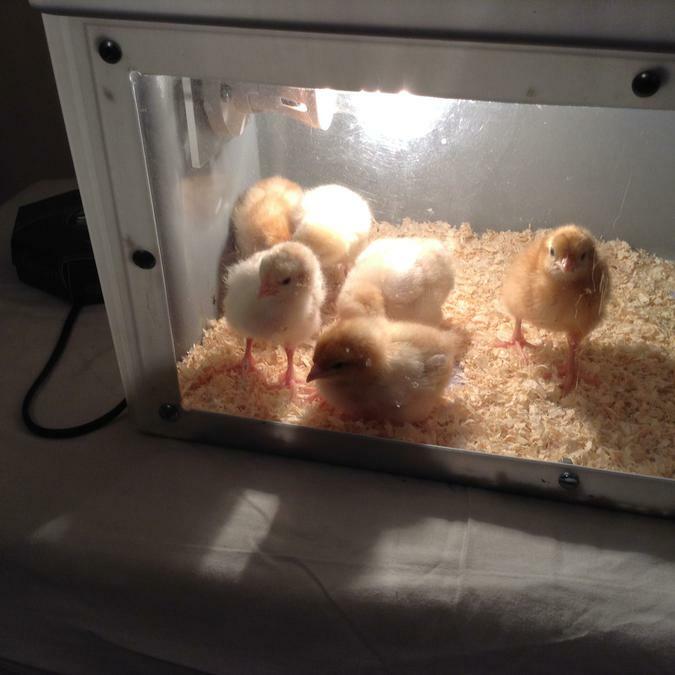 They need to be kept warm which is why the light must be left on inside the brooder. 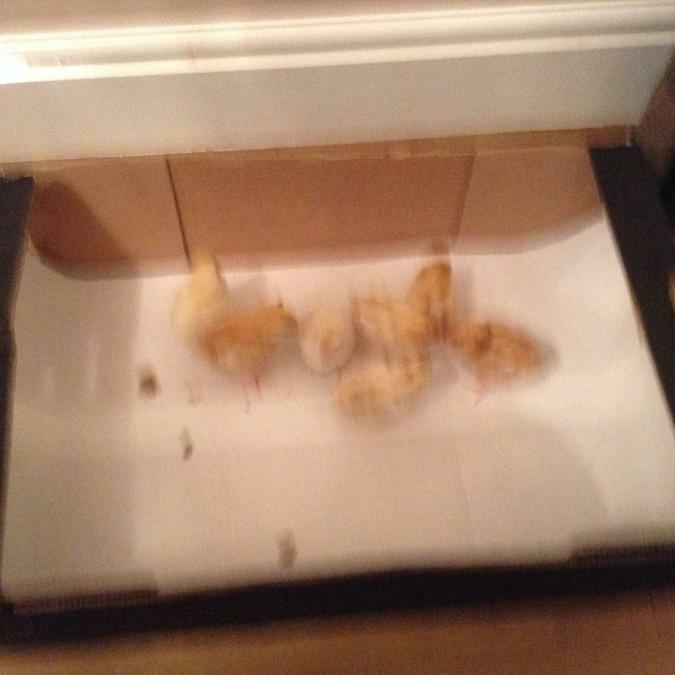 The chicks are going to Mrs Holt's house for the weekend. 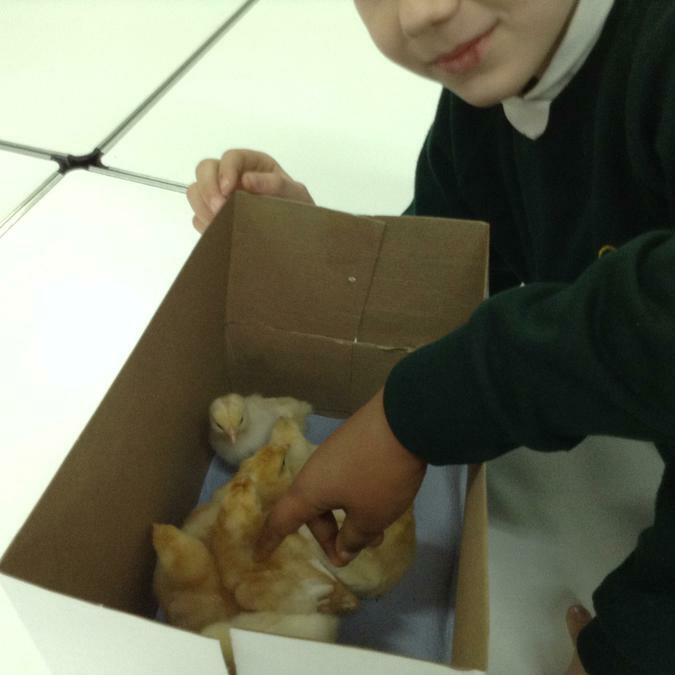 She will return them to school on Monday. 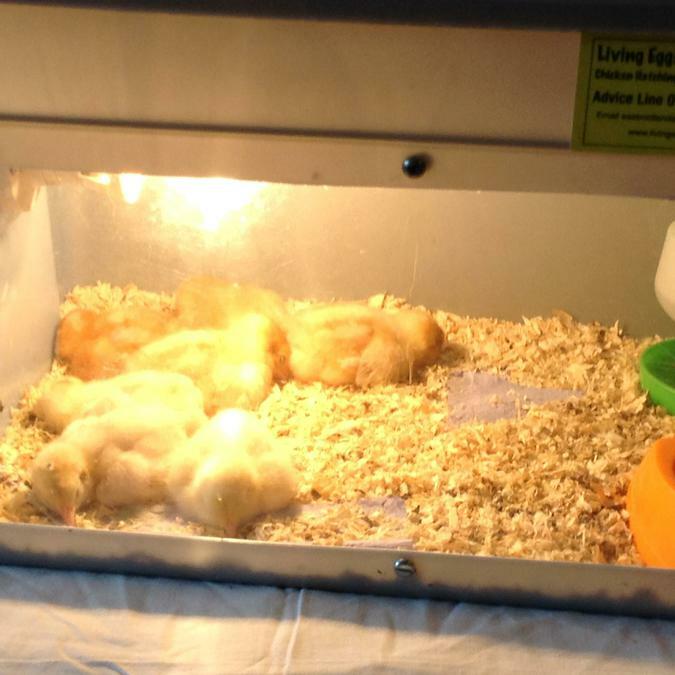 It's nice and warm under the lamp! We are trying to get comfy. Shall we all sit down? We have arrived at Mrs Holt's house. We are just settling down. 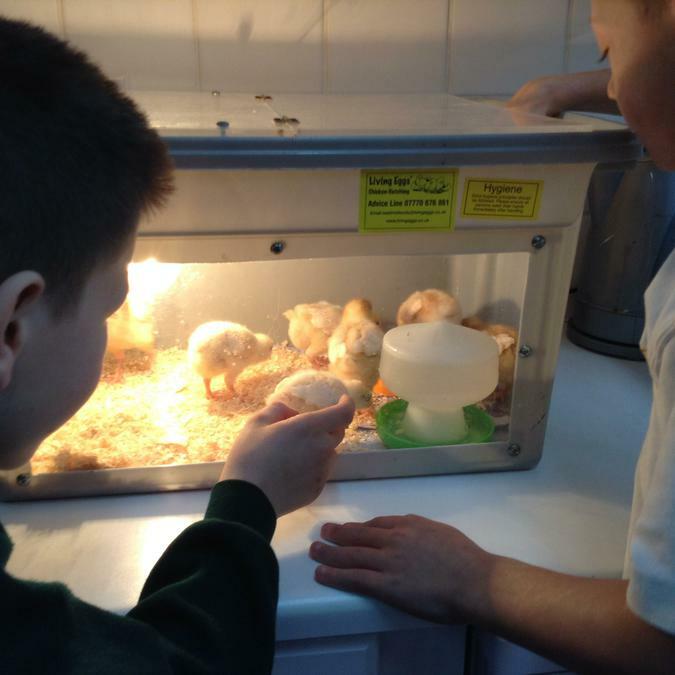 We have enjoyed our first day at Mrs Holt's house. We can see out of the window into the garden. I wonder if we can play out there? 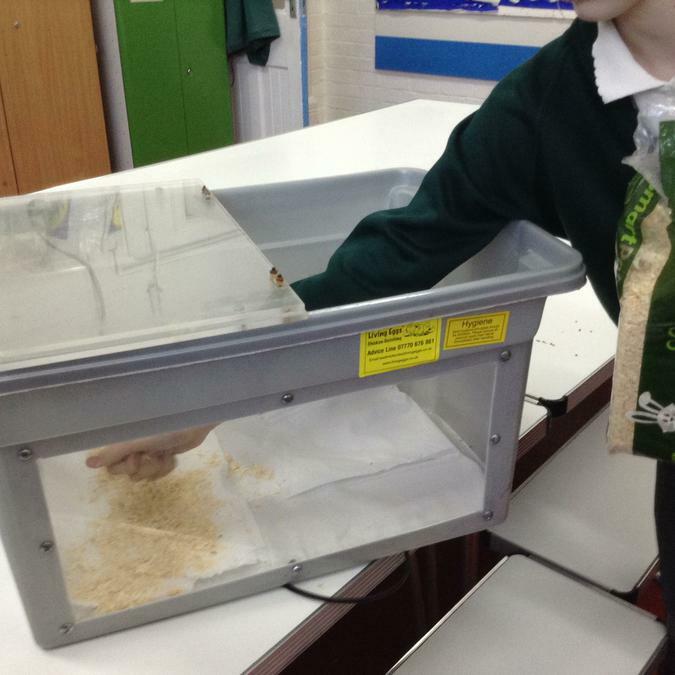 Mrs Holt has topped up our food and we keep jumping in it; we wont have any left at this rate! We are having a sleep. 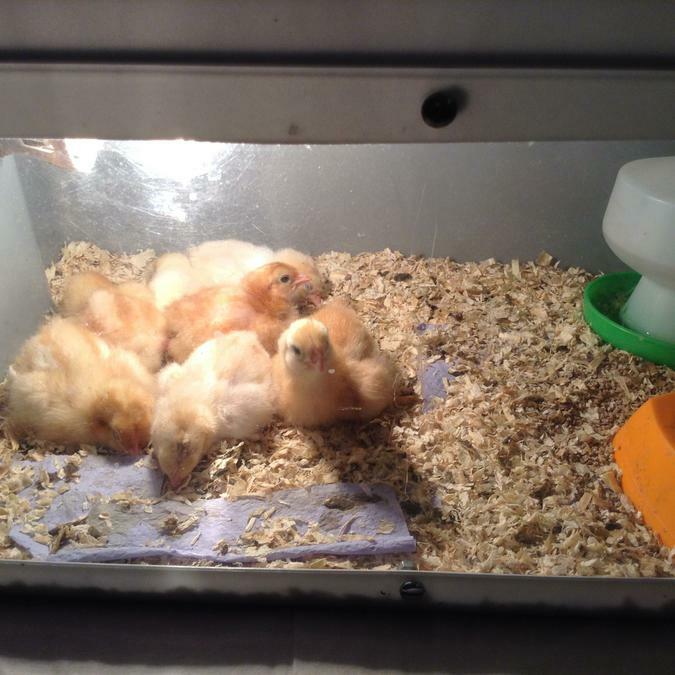 It's cosy in here, all cuddled up together. Who is that looking at us? This is our last day at Mrs Holt's house. 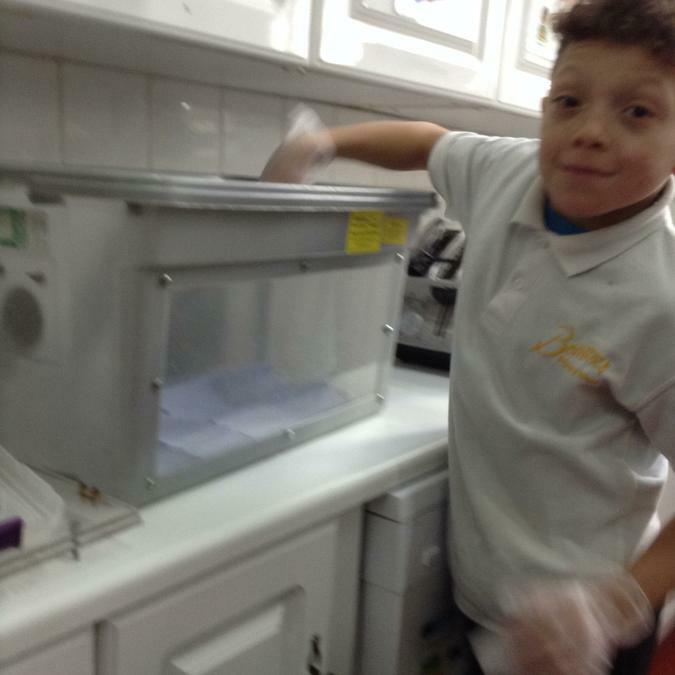 We are trying to be good today and not jump in our food; we are all making a big mess. 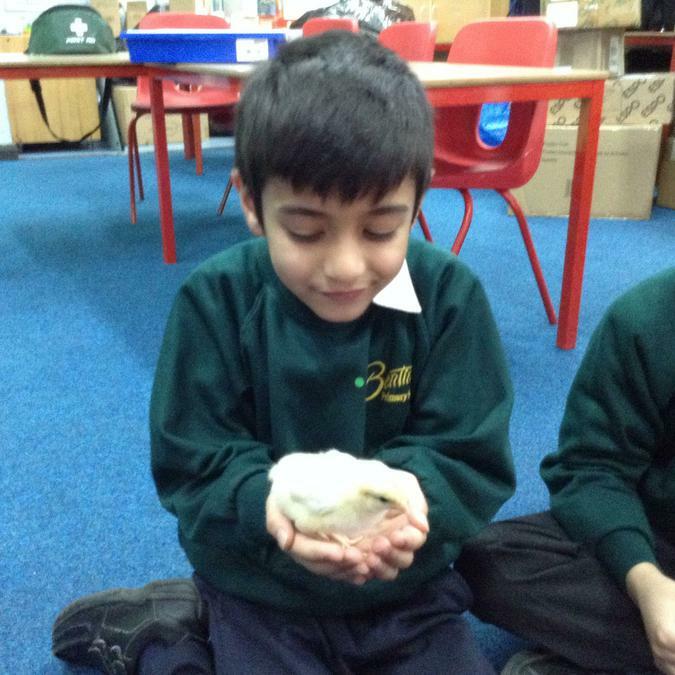 We are looking forward to going back to school so we can see all the children. 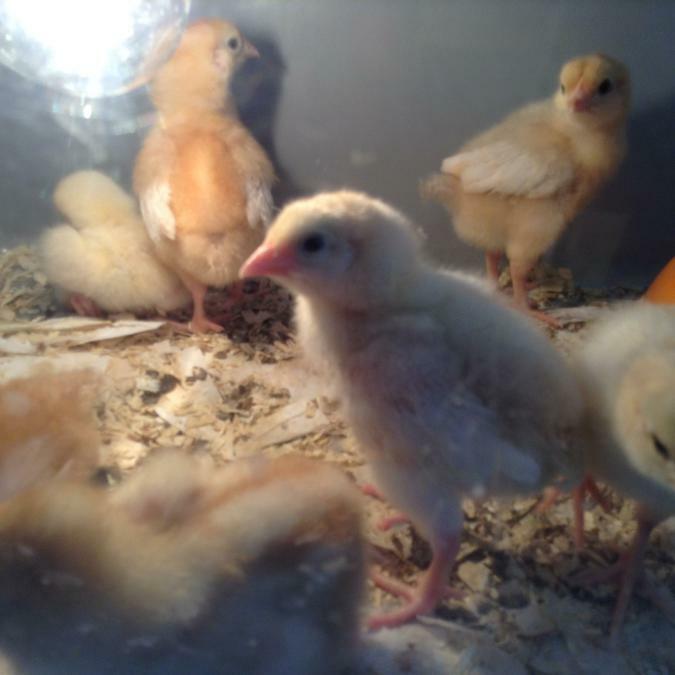 We are growing fast. 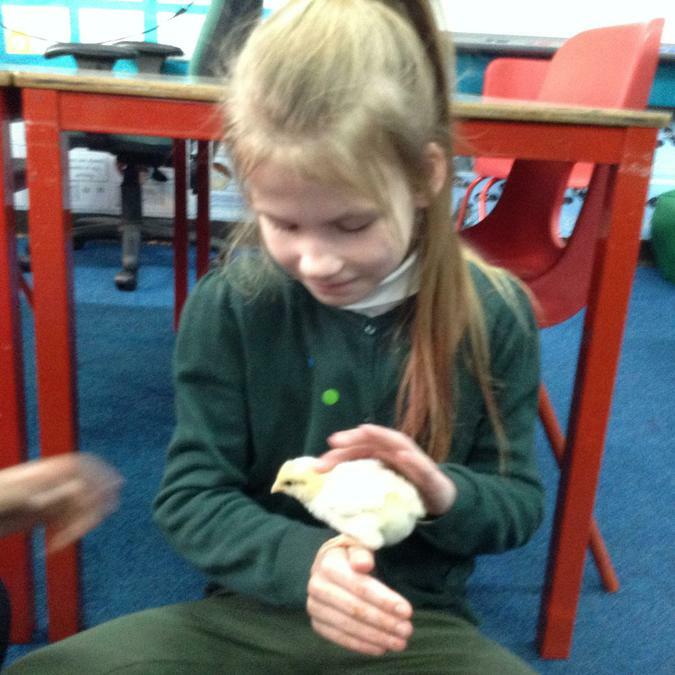 We are learning to jump and flap our wings. I think we made Mrs Holt jump! 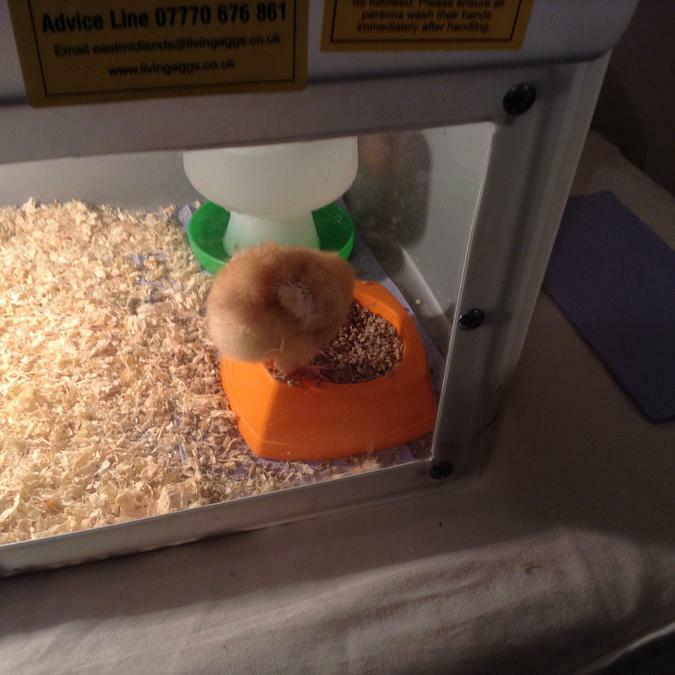 Our home will soon be too small for us!! 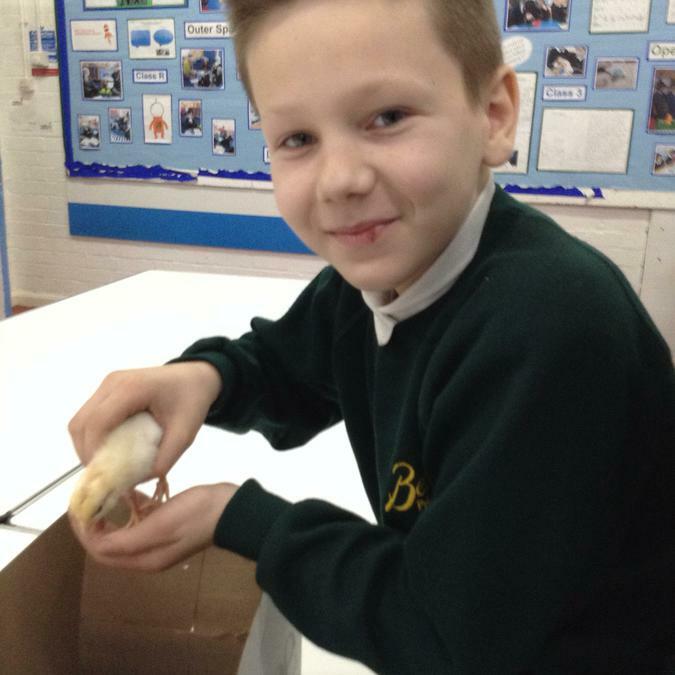 We are back at school! 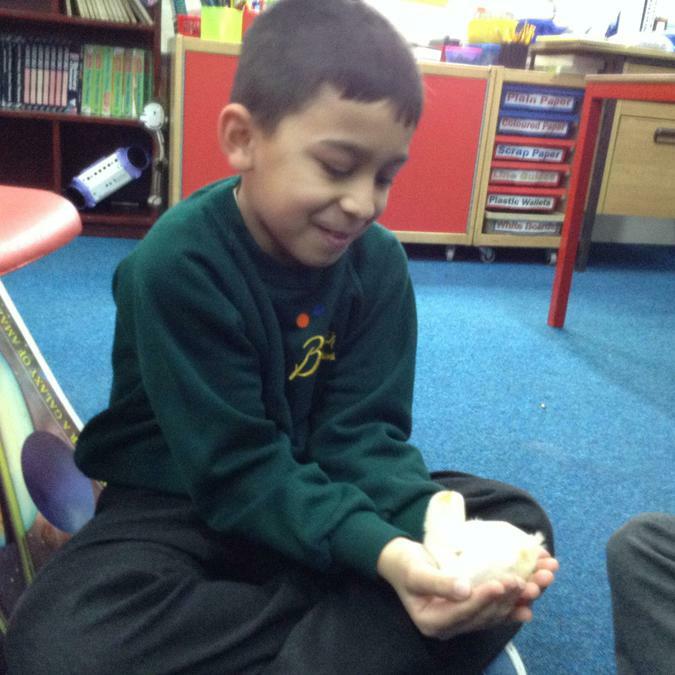 The car journey back was ok. Mrs Holt had the car heater on full blast and we all huddled together so we were nice and warm. The seat belt kept us nice and secure on the back seat. 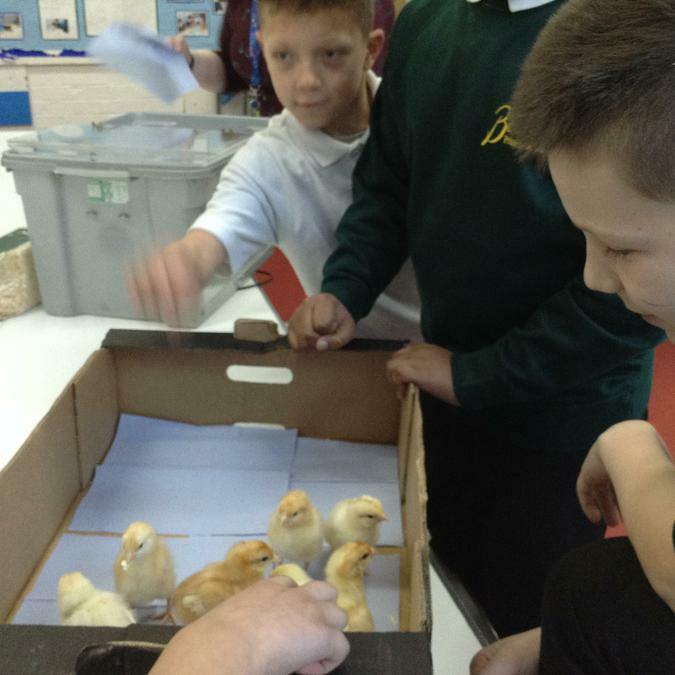 Mrs Holt took us back into school really quickly as it was raining! Phew! Back safe and sound. We are trying to get comfy again! I think I'll have a drink of water. 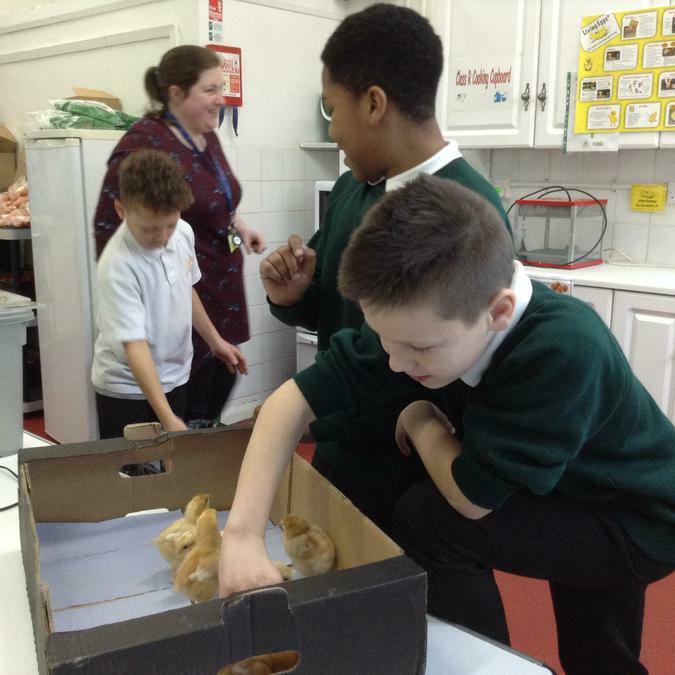 Mrs Schwartz took some Year 6 children to clean out the chicks. 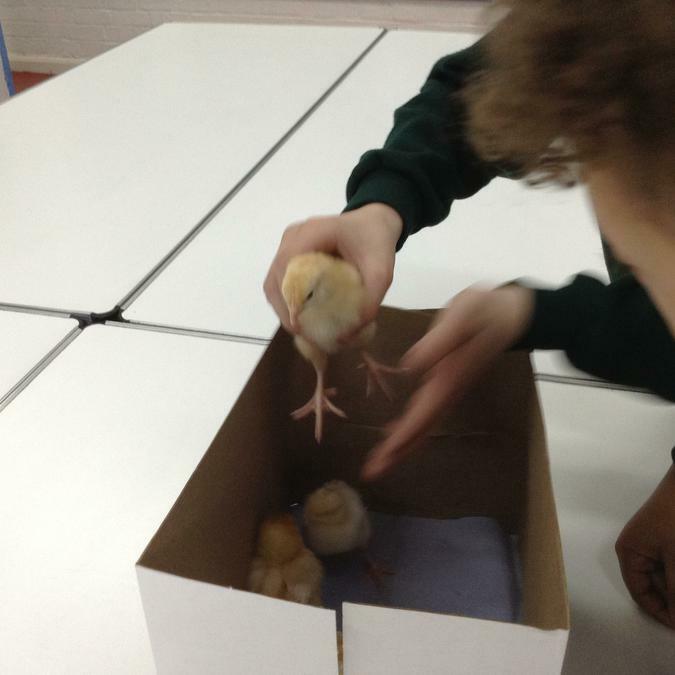 First the chicks have to be carefully moved from the brooder into another box. 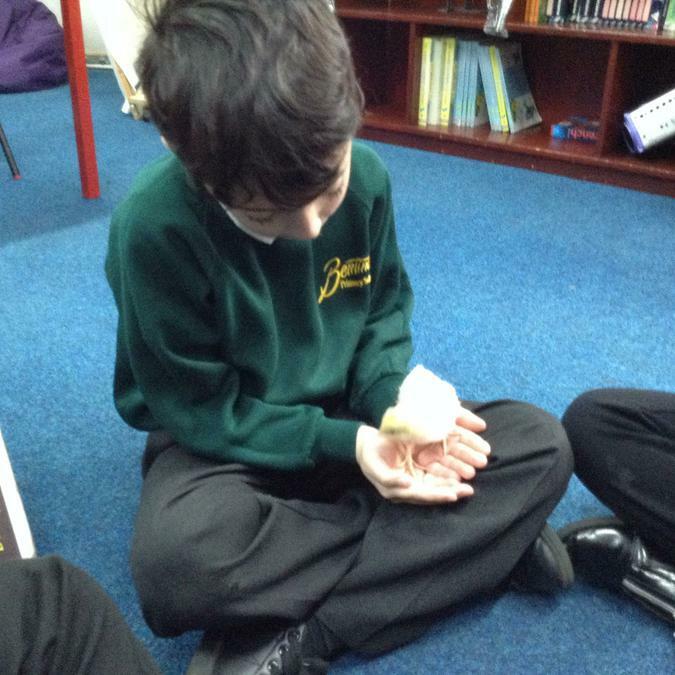 The paper and shavings are scooped up and put in the pin. 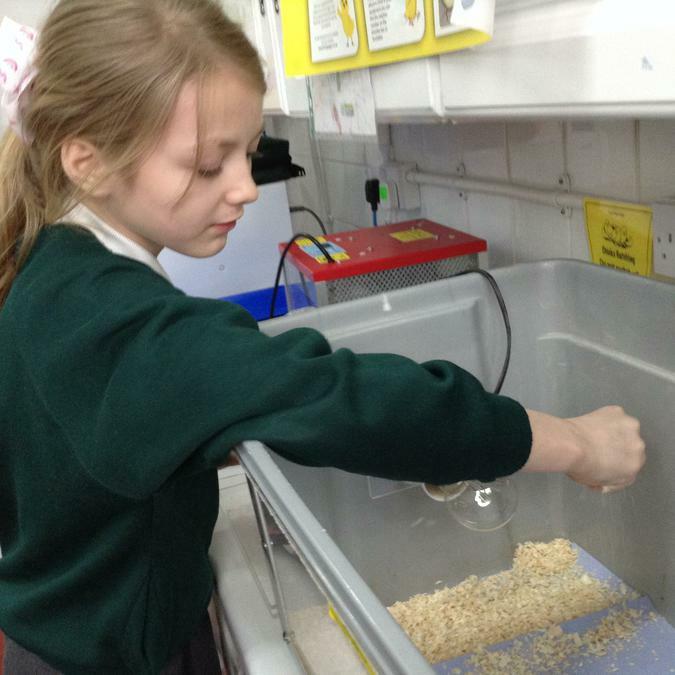 Their water tray is cleaned and filled with fresh water. 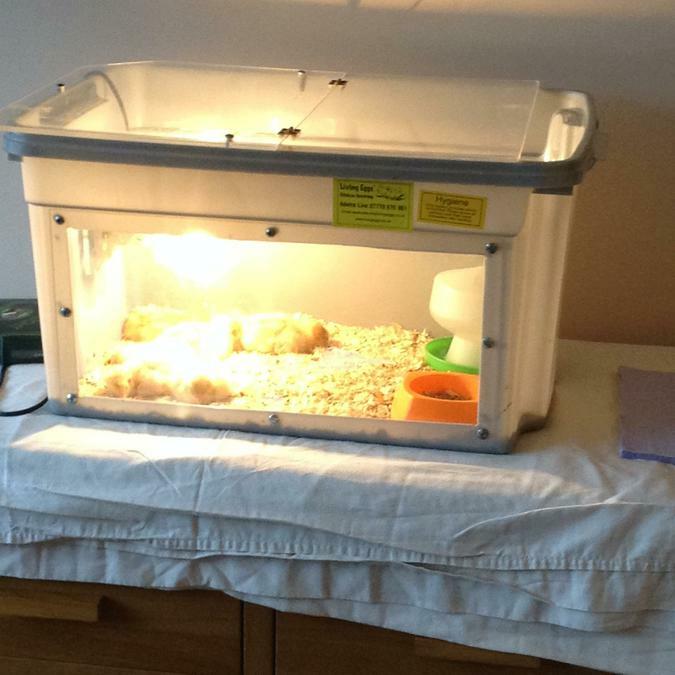 Their food tray is emptied and filled with fresh food. 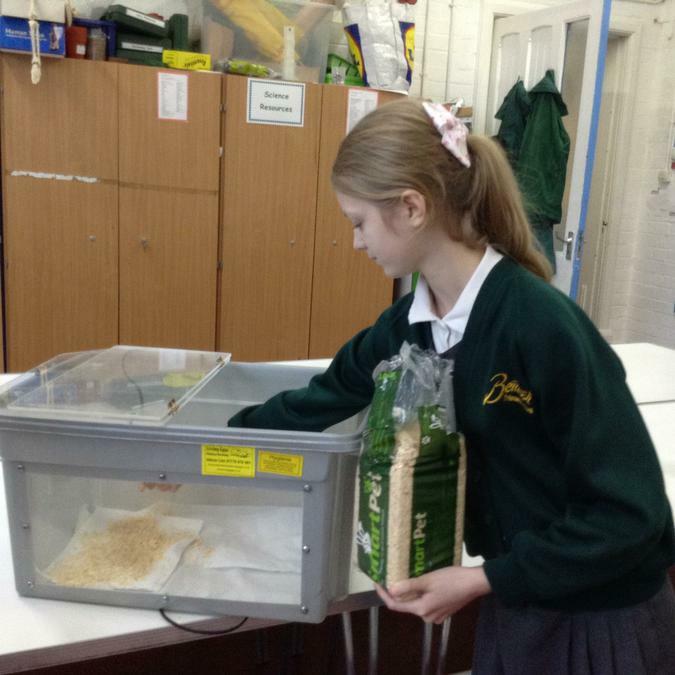 Clean paper and fresh shavings are put inside the brooder. 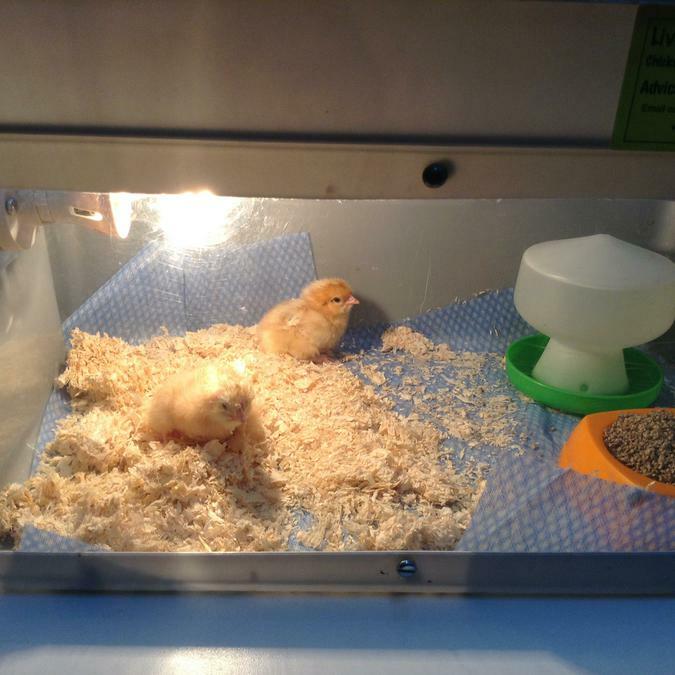 The chicks are then carefully placed back inside the brooder. All nice and clean ready to make more mess! They'll need cleaning out again tomorrow. 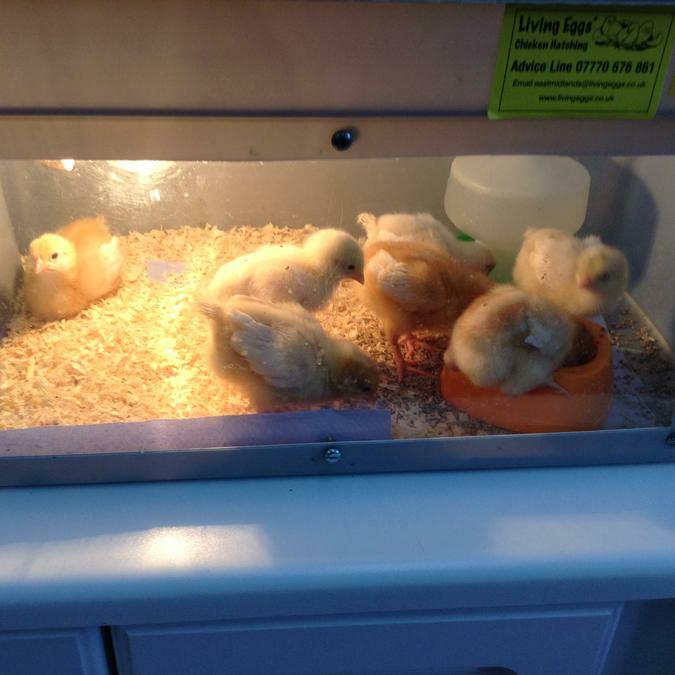 The chicks are growing big and strong now. 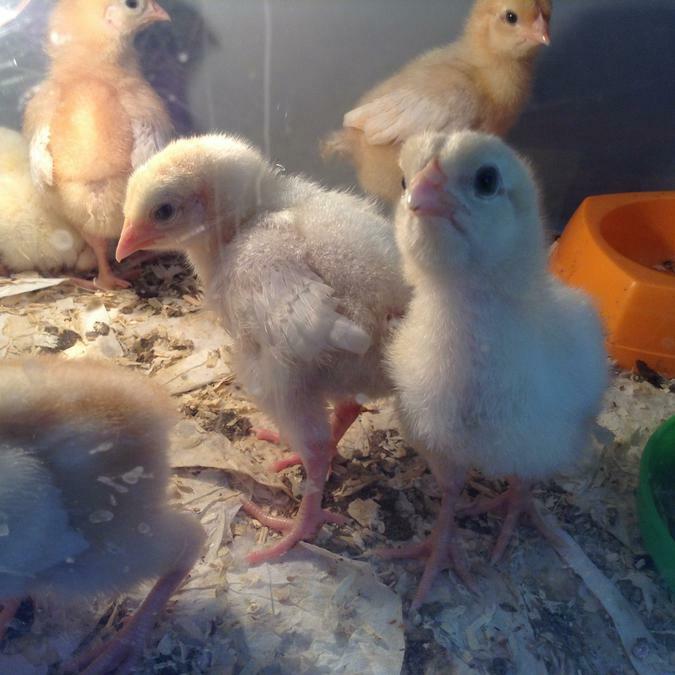 Their feathers are getting bigger and they are jumping around a lot in the brooder. 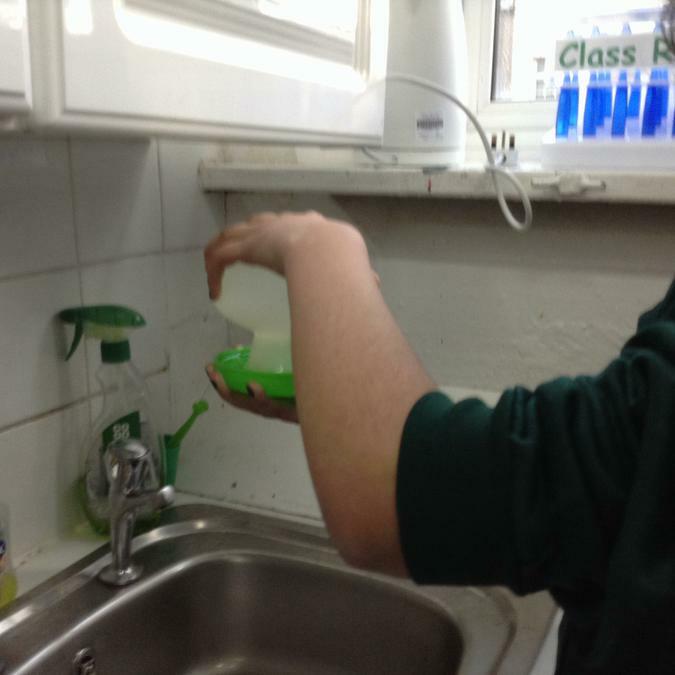 The Year 6 children are doing a great job of cleaning them out everyday. 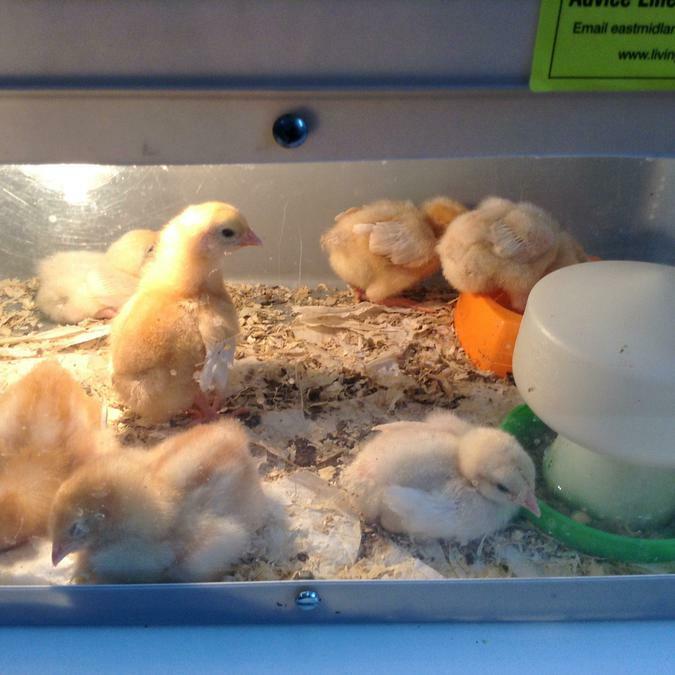 Look at the chicks now - they are getting so big. 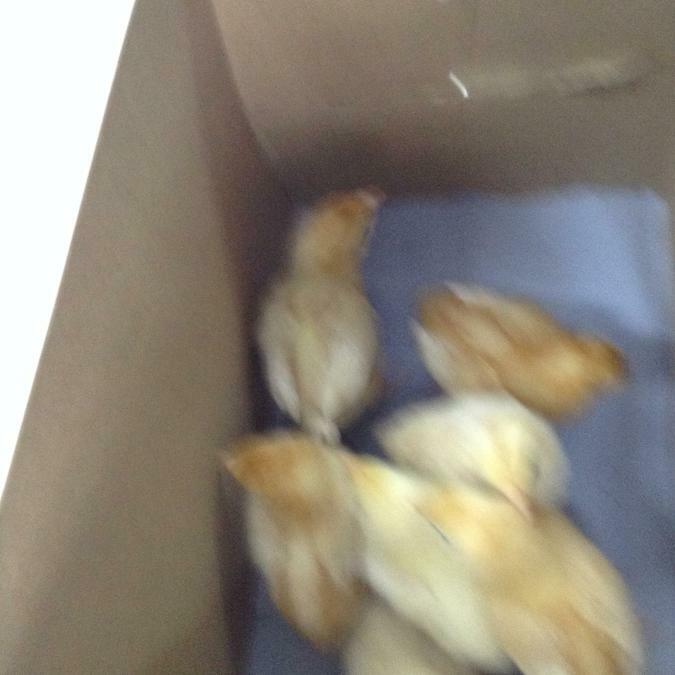 They keep flapping their wings and trying to fly. 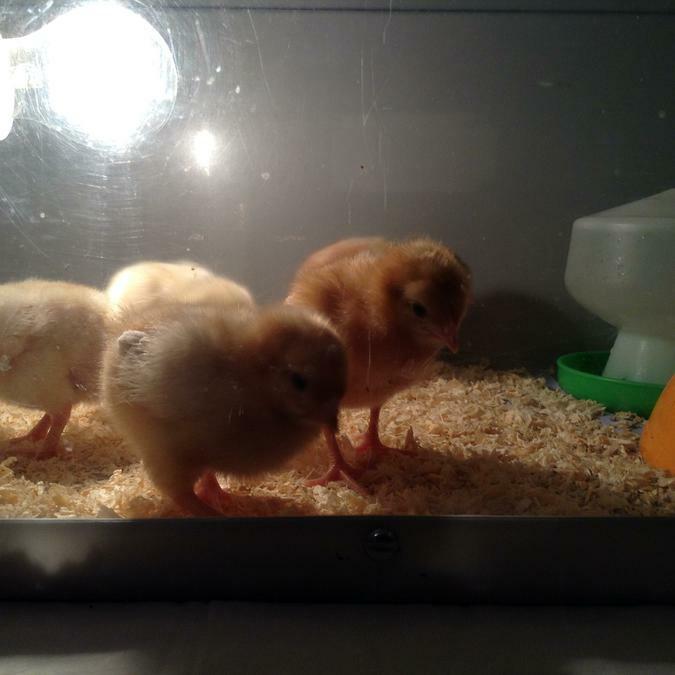 They are jumping over each other and becoming very inquisitive. 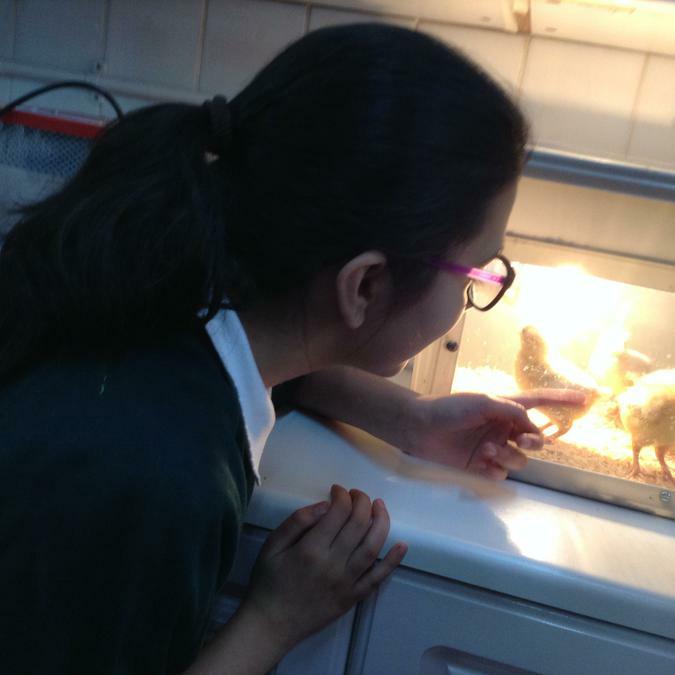 When someone looks into the brooder the chicks come forward to have a good look at them. They are very nosey!! 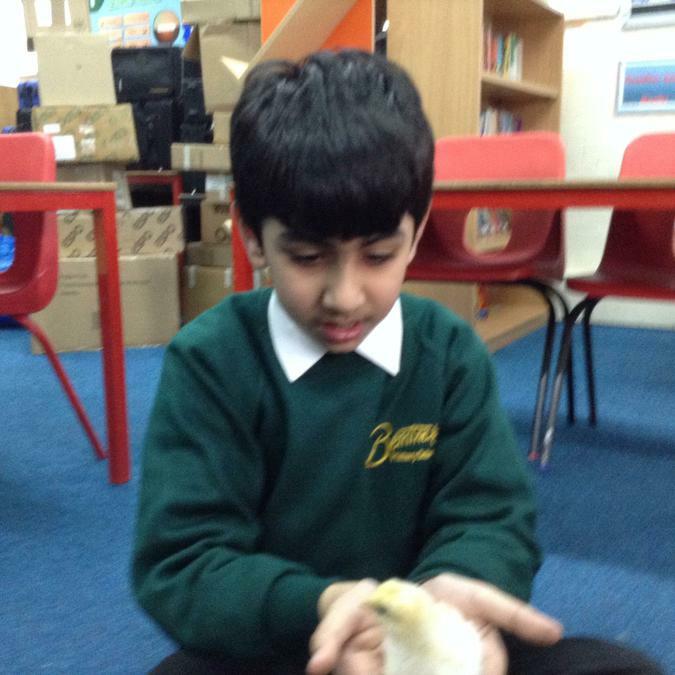 Children in Class 3 held the chicks today. 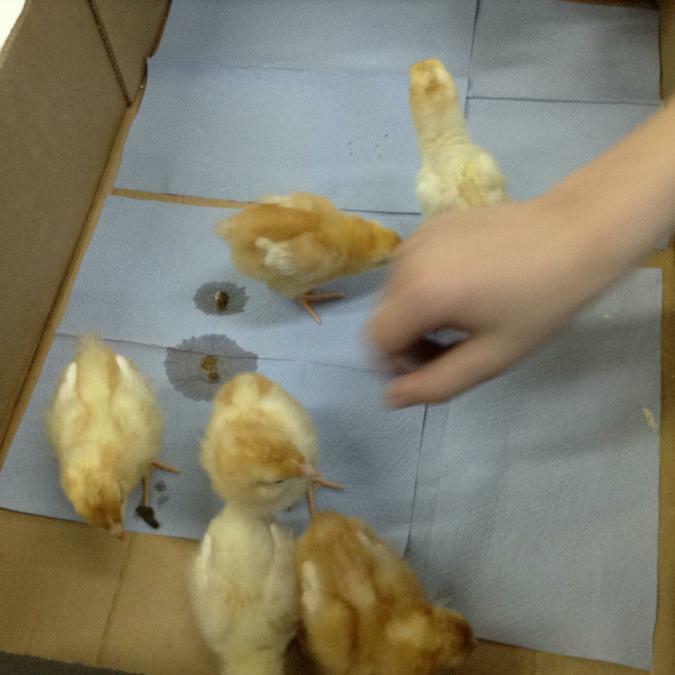 They were very gentle with them and took great care. 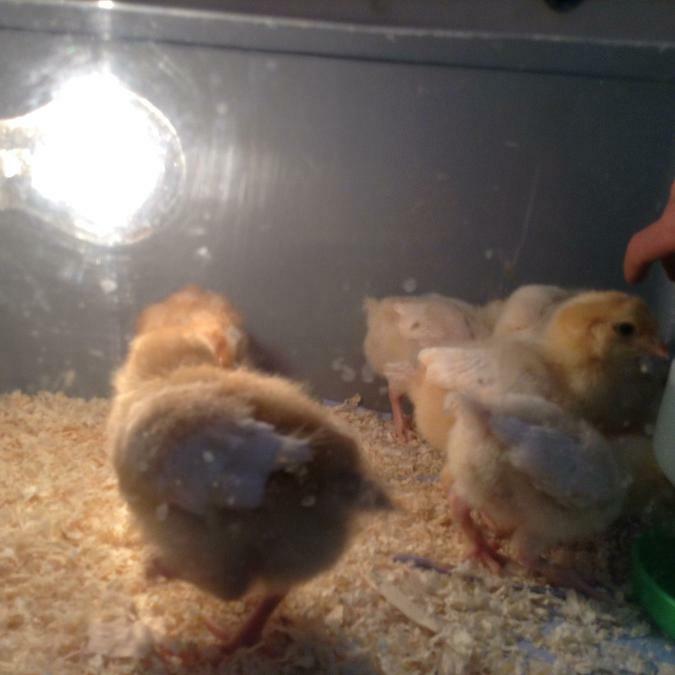 The chicks are very healthy and getting quite big now. They are ready for more space. 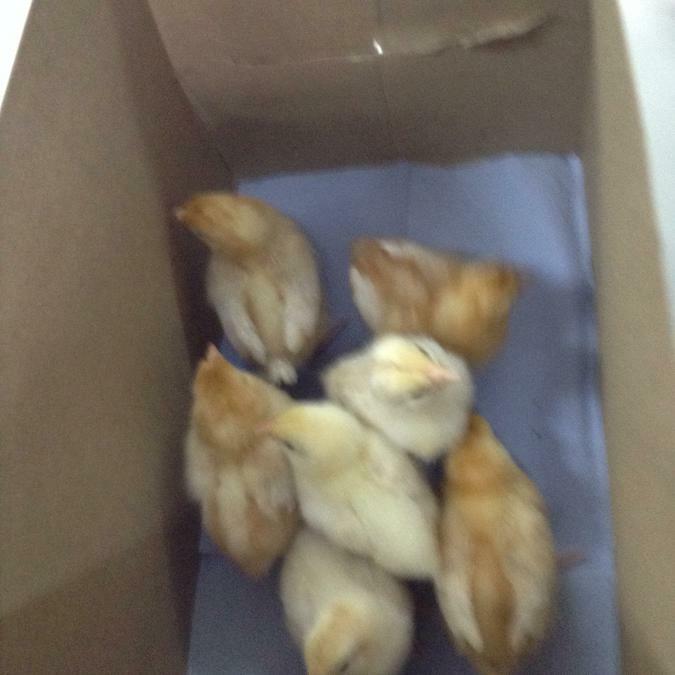 Tomorrow they will be collected and taken back to the farm. 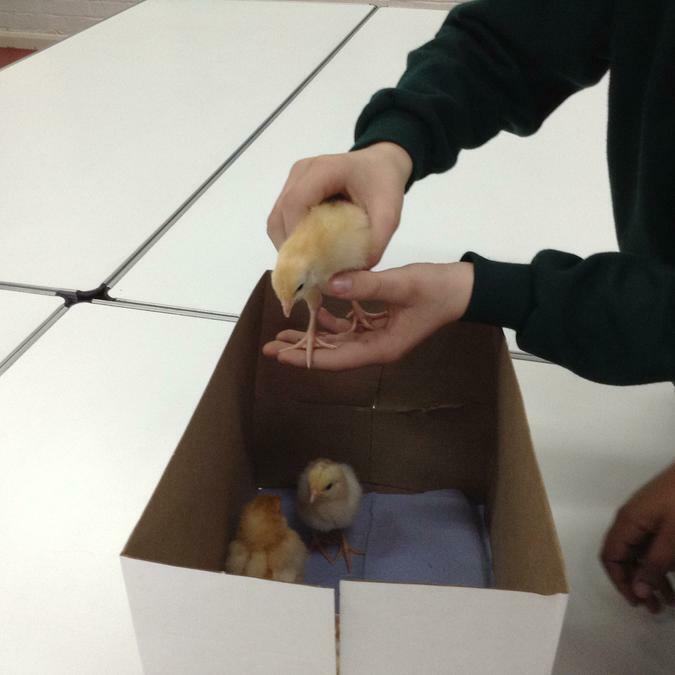 It's our last day with the chicks. 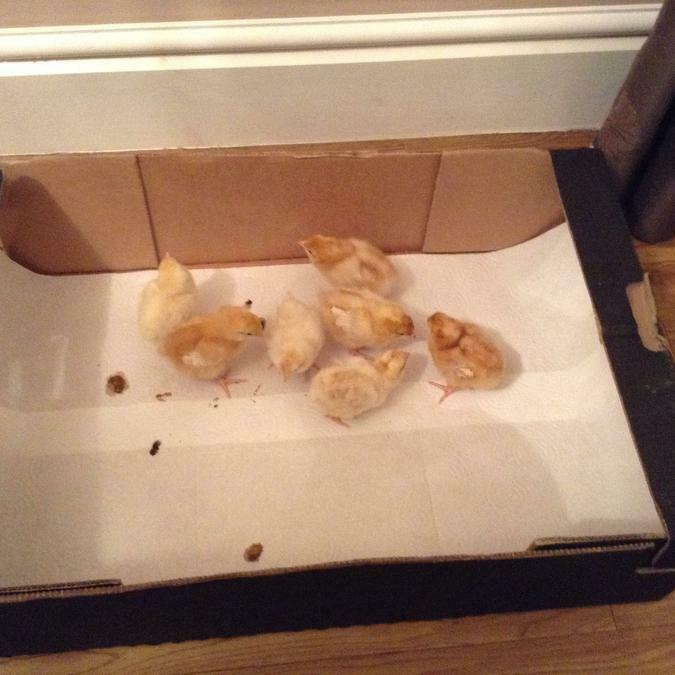 It's time for them to go to the farm where they will have loads of space. 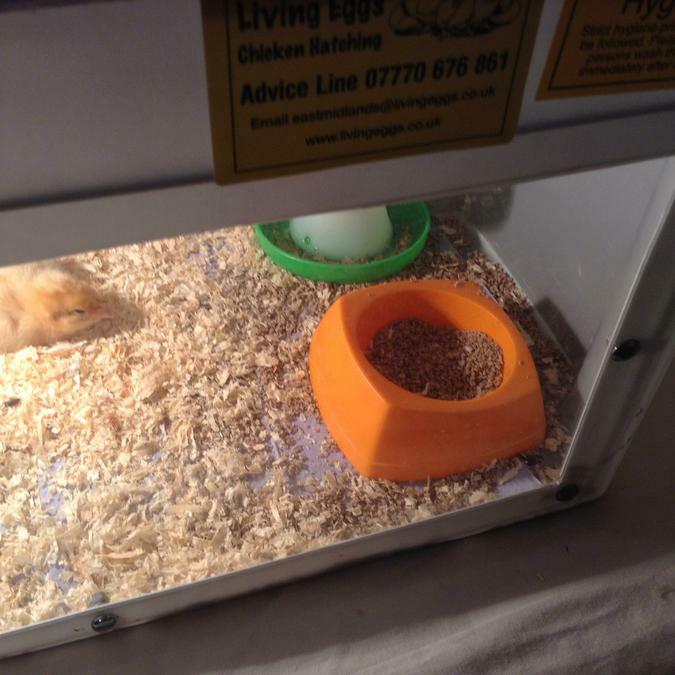 Simon , from Living Eggs, has come to collect them. 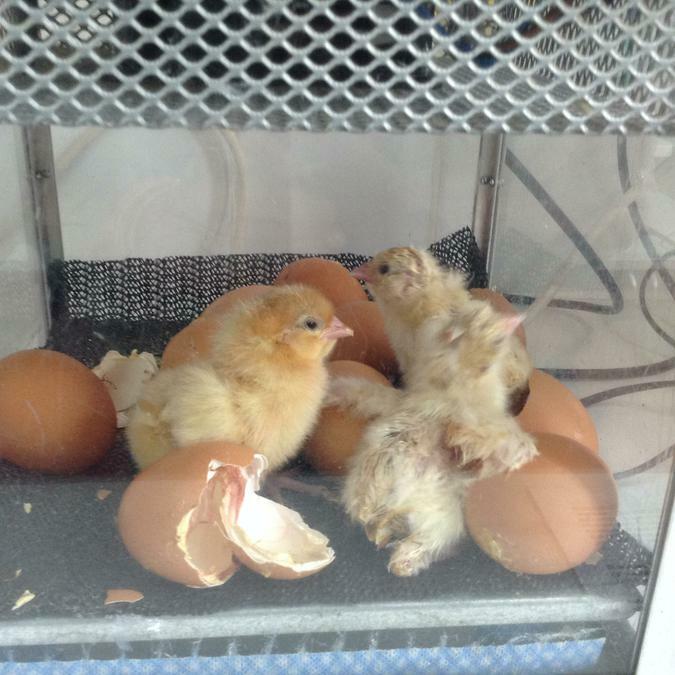 He is very pleased with how strong and healthy they are. 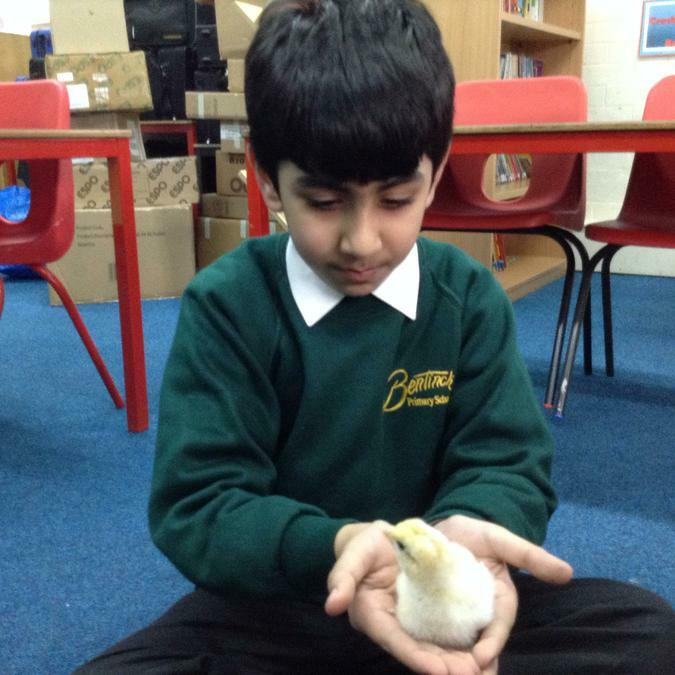 We have really enjoyed hatching and looking after our lovely chicks. 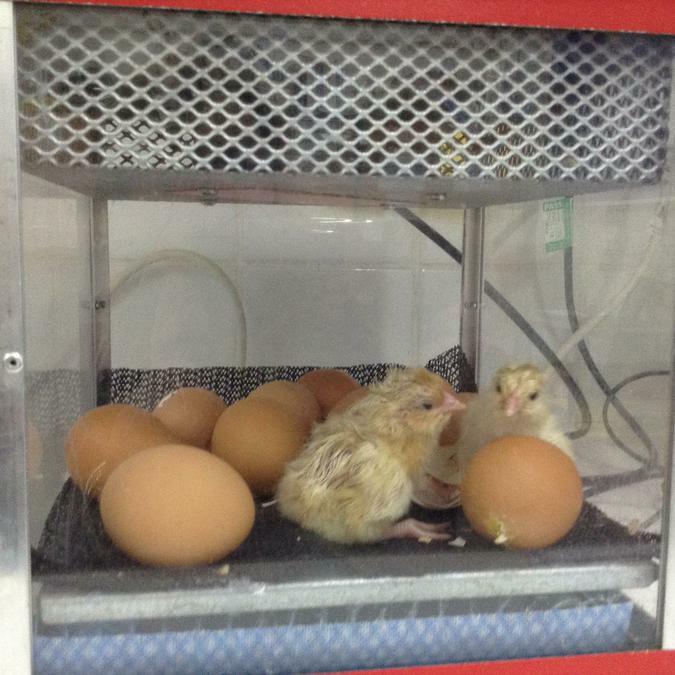 It's been great watching them hatch out of their egg and seeing how fast they grow. 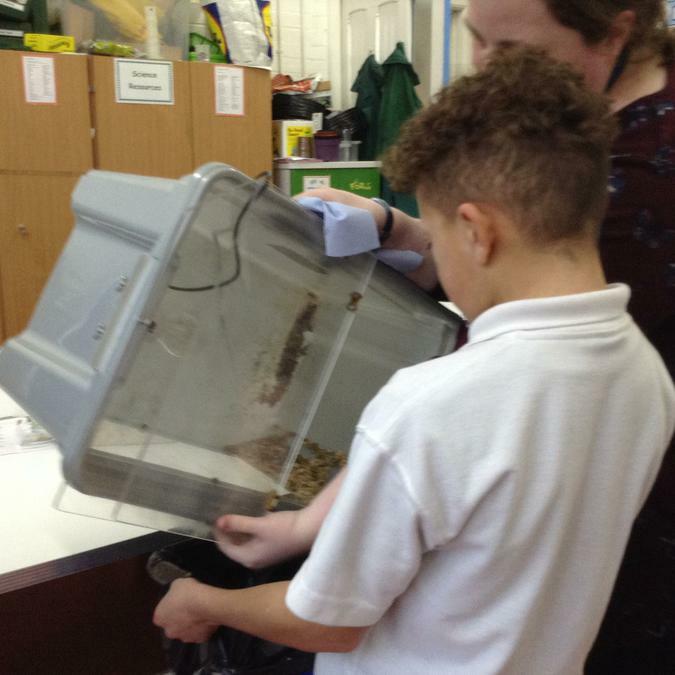 We have learnt so much. 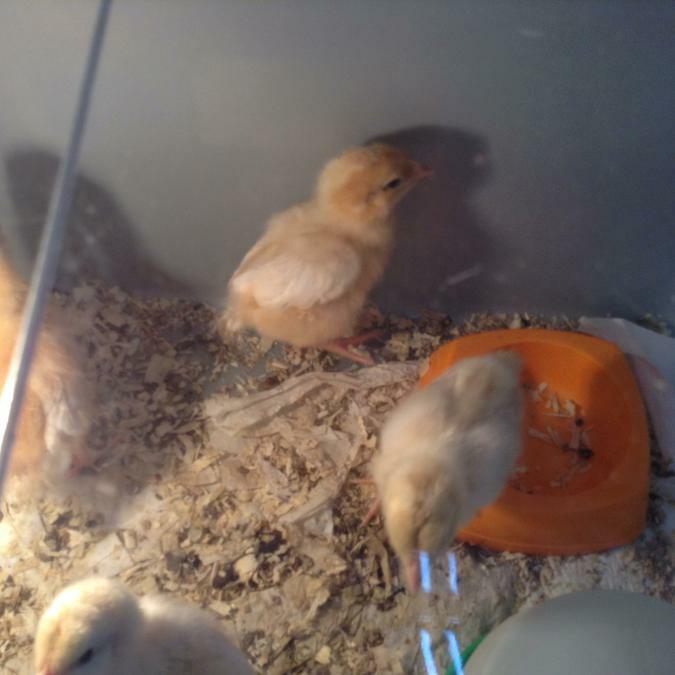 Why do they jump in their food bowl? 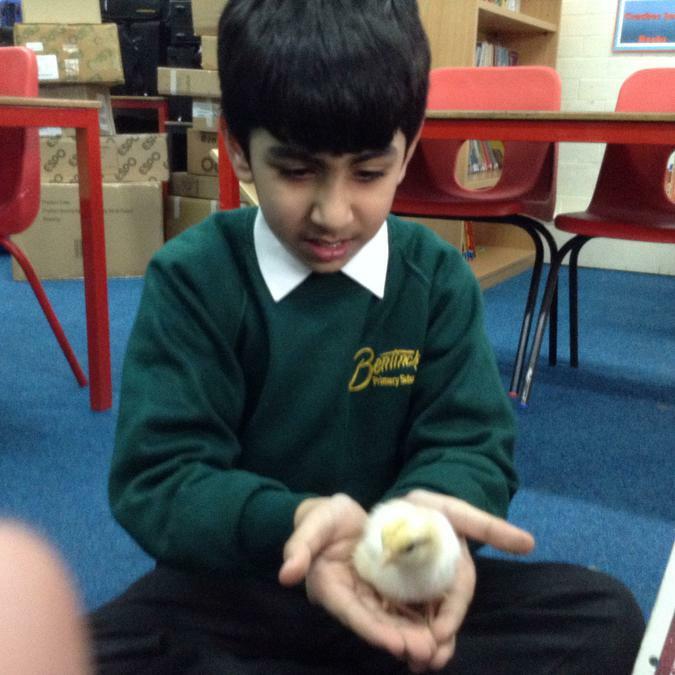 Simon has arrived to take us to the farm. 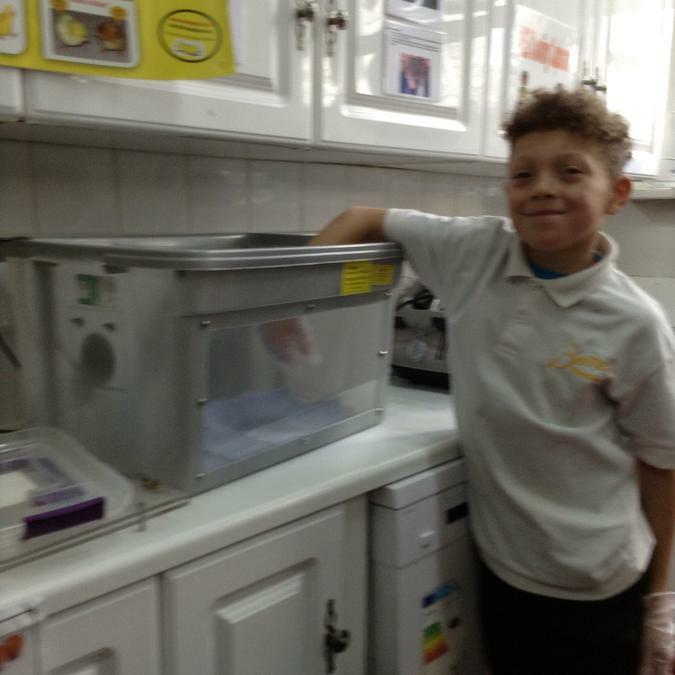 Bye bye Bentinck!!! Thank you.